Poets are still welcome in British Columbia's plan to re-tool the education system from Kindergarten to post-secondary institutions, but more welders would be nice, Education Minister Peter Fassbender said Tuesday. The prospect of one-million jobs in the energy sector by 2022, including openings for thousands of welders, pipefitters and heavy equipment operators to build the proposed liquefied natural gas industry and other resource projects, has the government looking to the education system to prepare a workforce. Fassbender and three other Liberal government cabinet ministers — Jobs Minister Shirley Bond, Advanced Education Minister Amrik Virk and Aboriginal Relations and Reconciliation Minister John Rustad — unveiled B.C. 's Skills and Jobs Blueprint, outlining the government's promise to give young people a seamless path from school to the workplace. Virk called the changes generational, saying universities will soon be looking to train more engineers, doctors and nurses to meet current jobs markets, while Bond said the province will adopt a pragmatic approach to education that includes using current data to target programs that focus on jobs that are in demand. "Our goal, ultimately, is to give every student ... a better, early head start on their future education," said Fassbender. "We want students to find their fit earlier. That's why we're re-engineering our education system from Kindergarten right through to post-secondary." The government said it invests $7.5 billion annually in education and training. The re-engineering program will allocate $160 million this year and within four years the funding will be $400 million annually. The blueprint has three objectives to maximize the school-to-jobs plan, including focusing on early, hands-on learning in schools, shifting education to match jobs in demand and entering partnerships with industry and labour to deliver training. One of the proposed changes includes reforming Grade 10 to 12 graduation requirements to give students skills and knowledge to find jobs after high school. The government will be asking post-secondary institutions to focus their training programs and courses on what it calls high-demand occupations and concedes that some courses like philosophy, will lose out to business, commerce and sciences. Fassbender said public school students will still receive arts and sciences courses, but trades options will be highlighted. He said the Accelerated Credit Enrolment in Industry Training program, that gives students completion and apprenticeship program credits to take trades training will be doubled to 5,000 spaces in the next two years. "What we're going to do is create opportunities for young people to see the wealth of opportunity," Fassbender said. "We celebrate the poets. We also celebrate the welders, the carpenters and the pipefitters." 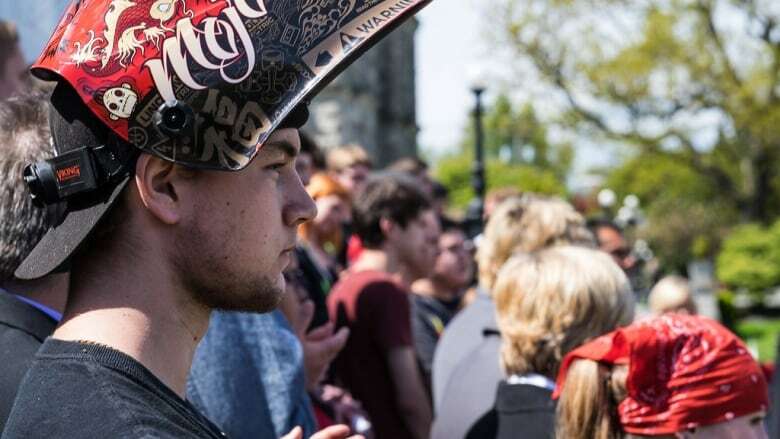 The ministers made the announcement on the front steps of the legislature accompanied by dozens of high schools students taking apprenticeship training courses. Some were dressed in welding gear and several demonstrated their skills at a mobile welding shop parked at the legislature. Victoria Grade 11 student Steven Creasey said the program is providing him with training to be a welder while he completes his high school graduation requirements. Bond said the government will undertake a complete review of the 10-year-old Industry Training Authority, including appointing a new board with strong leaders and partners with industry and labour. The ITA is a Crown corporation created to lead B.C. 's trades training system. Opposition New Democrat Leader Adrian Dix said Bond's plans to appoint a new ITA board and include labour input is an admission the Liberals botched its apprenticeship training program over the past decade. Independent Contractors and Business Association of B.C. spokesman Phil Hochstein said the new apprenticeship focus gives comfort to investors that B.C. is doing what it can to train skilled workers. "I think the government's on the right track," he said. "It's what business would do." Virk said post-secondary institutions have been aware that program changes are on the way. "This should not come as a surprise," he said. "We've been in discussions with our partners in the universities for a long time." The organization representing B.C. universities said its institutions are preparing young British Columbians for the competitive labour market. Universities Research Council chairman Stephen Toope said in a statement university programs are always changing to respond to student and parent demands. He said B.C. universities are graduating more students in engineering, science and health programs. "Put it all together, and university continues to be an excellent choice for young people," he said. "That's why students and parents are choosing to apply to university in record numbers."